Partly cloudy this evening followed by increasing clouds with showers developing after midnight. Low 47F. Winds W at 5 to 10 mph. Chance of rain 50%. Construction of the Capitol building was finished in 1902 and the wing annexes were added 10 years later. This historic image was taken around 1906 showing the building before the annexes. The dome above the rotunda in the Montana State Capitol. The Crown Jewel, the State House, the People’s House, the Big House, all are names that have been used to describe the same building — the state Capitol of Montana. The original building was completed in 1902 with sandstone quarried in Columbus. The old quarry is still visible from Interstate 90 and can easily be seen just to the northeast of the Columbus interchange. In 1912, east and west wings were added to the original building. For this work, granite from the T. Kain & Sons quarry in Clancy was chosen as the exterior building material. Now, over 100 years since the Capitol was constructed, it is still functioning as one of the most recognizable buildings in Montana. Its many years of service have truly included numerous occasions and events that have established a direction for the state and all its citizens. To a few Montanans it is the oﬃce where they work every day. There are elected oﬃcials such as the governor and the secretary of state, as well as individual legislators from all over Montana who come for biennial legislative sessions. There are the staﬀs for both executive oﬃces and legislative bodies. At this time of year it is crowded with lobbyists, schoolchildren and citizens who want to participate in their government. And at all times of the year, a constant ﬂow of visitors and tourists are anxious to experience Montana’s Capitol. And at the other end of the spectrum, there are people who have only seen the landmark from a distance as they traverse the roads around Helena as part of their daily routine. If you haven’t been inside the Capitol, you are missing out on something that early leaders in Helena toiled over many years to bring to fruition — a permanent location for the Capitol. Naturally, they took great pride in their ﬁnal accomplishment. It is a magniﬁcent building that extols Montana values from the copper dome and Montana stone to the Charlie Russell, E.S. Paxton and R. E. DeCamp paintings. The rotunda is a spectacular area with the grand stairs, the barrel vault, the colorful stenciling and the decorative plaster work. And as you might guess because of their historic signiﬁcance, the Senate and House chambers are popular areas to see, as is the Governor’s Reception Room. Whether you are an everyday worker or a one-time visitor, some of the features of the Capitol are hard to miss. For instance, it’s almost impossible to walk on the Capitol grounds or into the building without seeing the statue of “Montana” (formerly known as Lady Liberty) on top of the dome. It’s visible for miles in the Helena vicinity and is truly a landmark in the community. Or, if you consider the interior, can you imagine visiting the Capitol and not seeing the stained glass barrel vault over the grand stairs? This is especially true when sunlight is shining through the glass, casting a warm, magical illumination throughout the rotunda area. The recently installed Montana Women’s Murals are particularly vibrant on bright sunny days. Needless to say the Capitol is full of history and interesting architecture for all visitors if they choose to look for it. Some of it is clearly obvious, as indicated above, even if an individual is preoccupied with business to be conducted during the visit. However, other gems of the “Crown Jewel” are less prominent and often unknown even to many of the people working in the Capitol. Next time you are in the Capitol take a moment in the rotunda and look around you. You will see not only many of the features described earlier but an array of additional items that add to the overall ambiance of the space. For example, look closely at the four ornate brass light ﬁxtures with the glass globes on the balusters of the grand stairs. They certainly add an elegance to the space and a sparkle to it. Look closer and you will see that each glass globe has the Great Seal of the State of Montana etched into it. After you have checked out the light ﬁxtures, look to the top of the stairs and notice the painting in the south end of the barrel vault, just over the beautiful semi-elliptical stained glass window. You are looking at Amedee Joullin’s “Driving of the Golden Spike,” which was presented to the state as a gift from the Northern Paciﬁc Railway Company in 1903. It depicts the driving of the golden spike at Gold Creek in 1883 which joined the east and west sections of the railroad. There is still more to see from where you are standing, so now take note of the four circular paintings at the intersection of the dome and the rotunda walls depicting typical Montana characters. The “Trapper,” the “Miner,” the “Indian Chief” and the “Cowboy” were all painted by F. Pedretti and Sons as part of the decoration of the original Capitol. 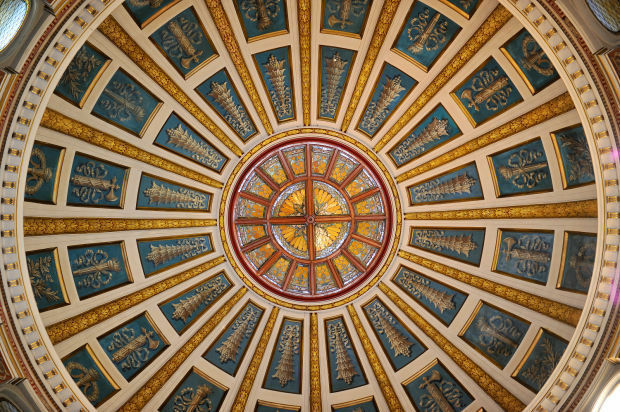 If you look above these paintings all the way to the top of the rotunda, you will see a stained glass oculus. What you cannot see is the concrete ﬂoor at the level of this window, which creates a cavernous room inside the exterior copper dome, and above the interior dome that you see from the rotunda. There is a small, winding circular stairway to this area from where you can look out of the many circular windows surrounding the base of the copper dome for beautiful views of the Sleeping Giant and Helena. As you might guess, this is an area that is closed to the general public, as the climb through the superstructure is not for the faint of heart! Okay, by now some of you will no doubt have developed a serious kink in your neck and are anxious to see something of interest at ground level instead of at 90 degrees from your normal ﬁeld of vision. The rotunda area deﬁnitely has more for you to discover. See all those “marble” columns around you? Actually, they are all steel columns that are covered with a decorative plaster. Gently rap on them with your knuckle; they will sound hollow. The material is known as scagliola and it was also used for the columns in the old Supreme Court Chamber, which is now Room 303. While the columns in the rotunda have beige/brown tones, the ones in Room 303 are white, similar to those found in the nearby Cathedral of Saint Helena. Another gem to be found is much smaller than many of the others, but it is also much more prevalent than most of them. Go look at any of the doors adjacent to the rotunda or in the hallways going to the Governor’s Oﬃce or the Secretary of State’s Oﬃce. Take a close look at the brass door knob and you will see that the Great Seal of the State of Montana has been cast into it. This is typical for all the door hardware in the public areas of the Capitol. Now you know that the glass globes on the grand stairs aren’t the only feature in the Capitol containing a subtle message to be found by visitors. If you have visited the Capitol in recent years, have you ever noticed the intricate patterns in the tile ﬂoor you have been walking on since you entered the building? While it is not the original ﬂoor that was installed in 1902 and subsequently removed in a 1960s remodel project, the pattern and the colors in the the 2001 Capitol Renovation project replicate it. The tile pieces in the original construction were larger than the one inch square pieces in the existing ﬂoor, but the overall look is very much like a person would have seen entering the Capitol over 100 years ago. There are literally hundreds of thousands of tile pieces throughout the Capitol and the patterns are routinely repetitive. That is unless you look closely in some areas. If you are lucky you will ﬁnd some apparent “mistakes” in the layout of the tiles. Those mistakes are really a signature mark of the artisan laying the tile and were intentional. They are diﬃcult to spot but one of them is very close to the grand stairs if you are inclined to search it for yourself. Good luck, the pattern will play tricks with your eyes. As you may have ﬁgured out by now, the Capitol is one of my favorite buildings in Montana. It has a colorful history and many more “gems” to be shared with you in the future. But for now, on your next visit to it, maybe you will take an extra moment to look for one of the features described above so you will have a gem of your own to share with a coworker or friend about about our Capitol. Enjoy your visit! Tom O'Connell is the former administrator of Montana's Architecture and Engineering Division and a member of the Lewis and Clark County Heritage Tourism Council, which provides the monthly "Nuggets From Helena" column for the Independent Record. 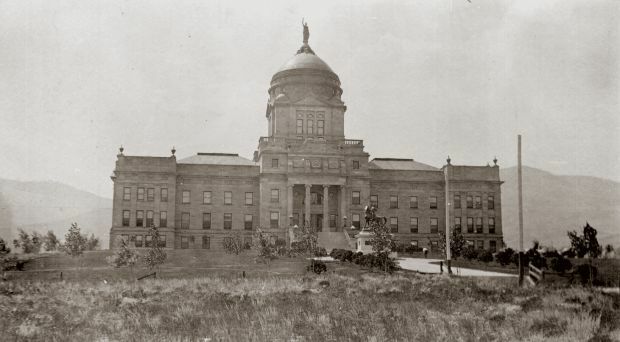 From its earliest years to modern times, here are several photos of the Montana State Capitol for your enjoyment.